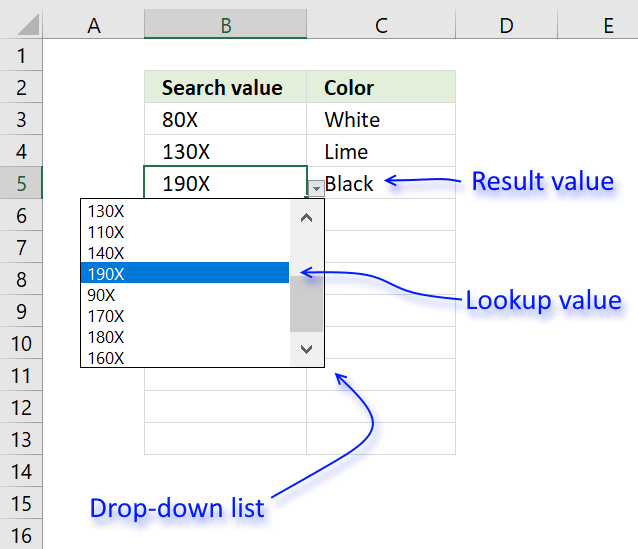 In this article I´ll show you how to lookup two or more values in a list and return (if possible) multiple matches. 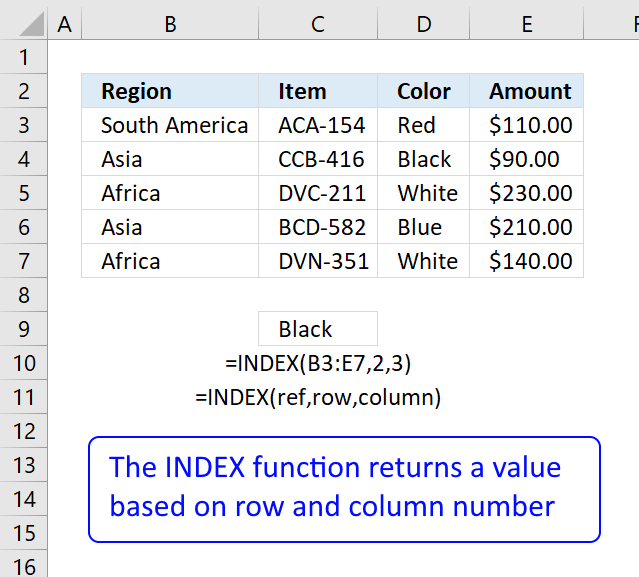 The picture below shows you a table in column B and C, the search criteria is in column B and the results are in column G.
I am not using VLOOKUP at all in this array formula, the VLOOKUP looks for a value in the leftmost column of a table, and then returns a value in the same row from a column you specify. 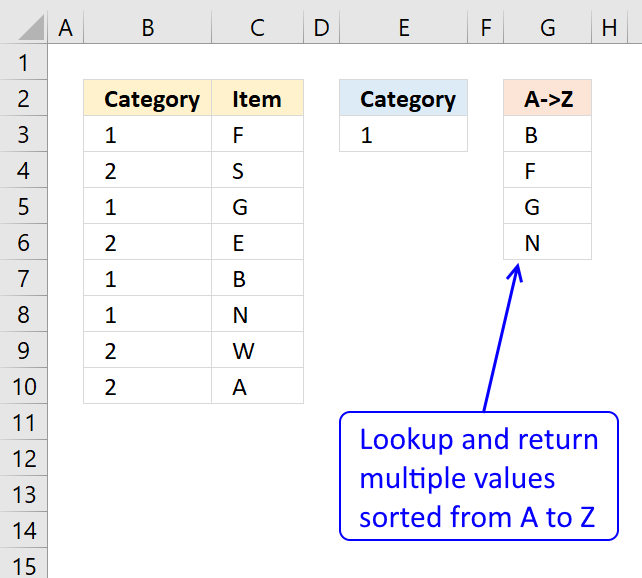 The VLOOKUP function is not designed to look for multiple values and return multiple values. Don't enter these characters yourself, they appear automatically. 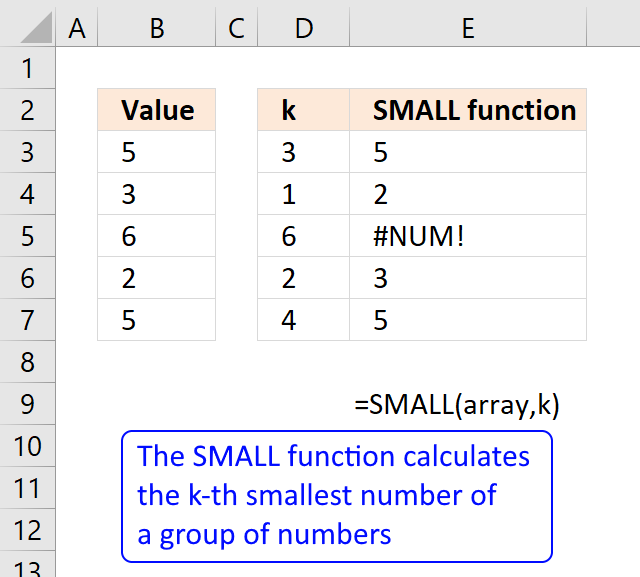 You can easily follow a long as I explain the array formula, download the workbook. 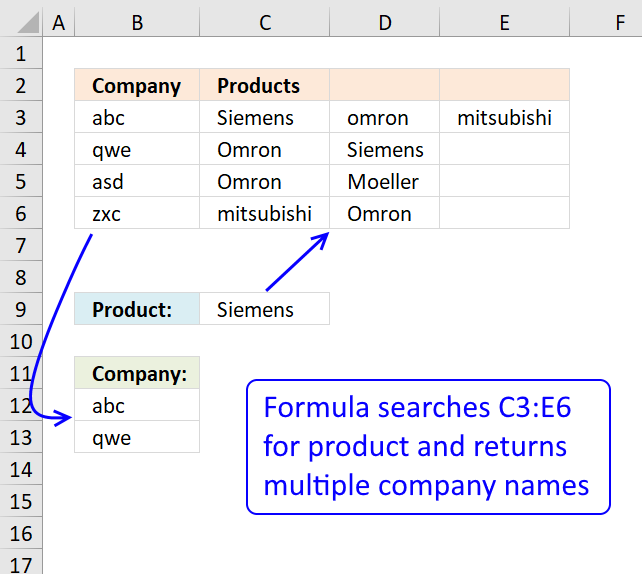 Select cell B13, go to tab "Formulas". 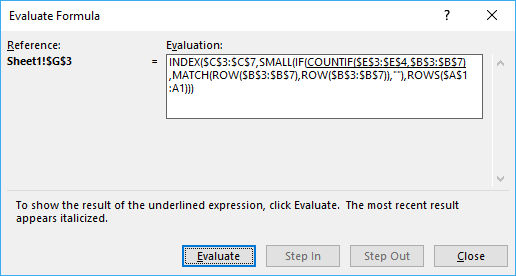 Click on "Evaluate formula" button. Click on "Evaluate" button show above to move to next step. 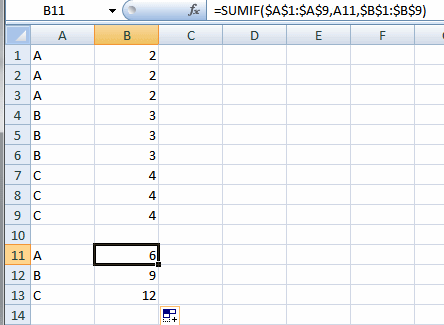 These are the row numbers that correspond to the matching values US and Asia in column B.
and returns Pen in cell E7. VLOOKUP a multi-column range and return multiple values. Oscar, on the first formula, any reason why you have multiplied with ))*(SEARCH(search_tbl, TRANSPOSE(INDEX(tbl, , 1, 1))))? As this step looks redunant? 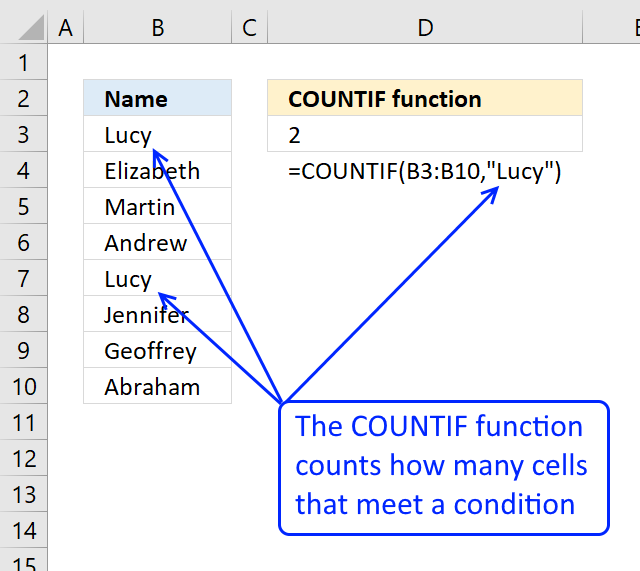 Using countif() instead of search() reduces formula size. 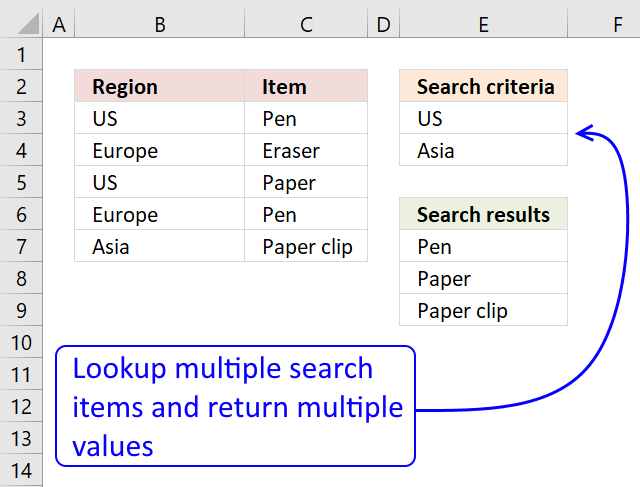 The reason why I multiplied two search() in the first place, was to remove any cells that contained the search criteria, I was looking for exact matches. Does anyone know how to do a vlookup of three columns to pull a single record? Match a single criterion in any of three columns? Match three different criteria in each column? Match any of three different criteria in any column? if I add manually group A total is $6 and B total is $9 and C total is $12. Oscar, what happen if I need to use IF(ISERROR(Vlookup)) and the datas are pretty big for every month. Is there a way to request Vlookup to pickup more than the first data? I have a large database with 40 columns, I wish to extract a few column data into separate sheet for printing. The goal is actually a male name list and a female name list with another criteria from a column that is confirmed. Which page shows the examples? 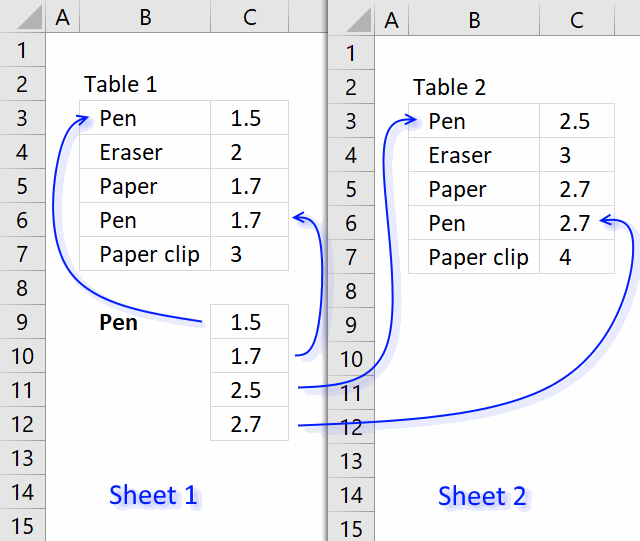 Excel tables are easy and fast! 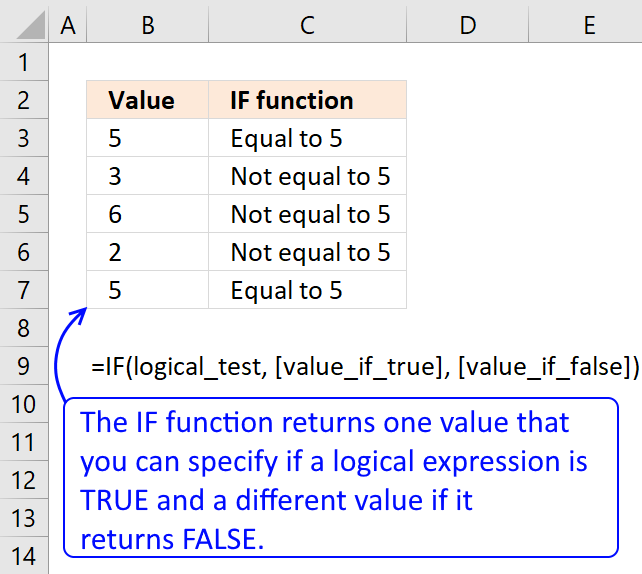 I am using this formula and have found that it does not produce all of the results from the data file. There are 1 - 15 instances of the account number in Column (A). 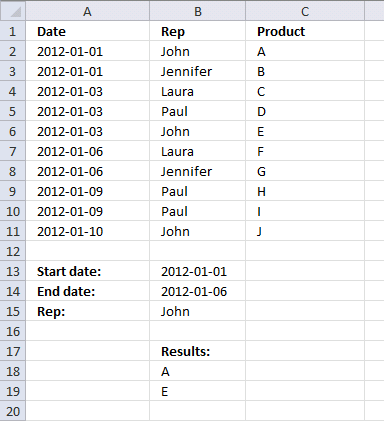 The instances may be on different or the same day (date) in column (B). The notes in Column (C) are all different. The results being returned are limited to only two rows per date. So if I have 5 Notes on 01/01/2012....the results are only returning 2 of them...it appears to be the two middle rows. Thanks for the great formula!! Thanks, This is so useful!! your explanation makes wonders happen. But can I ask how do you learn this kind of stuff? Inspired by others. Trial and error. As far as I know there are no array formula books out there. On the above example, is there any way I can tranpose the results against the original search ref. as oppose to the vertical lists so that I don't have just a long string of values. 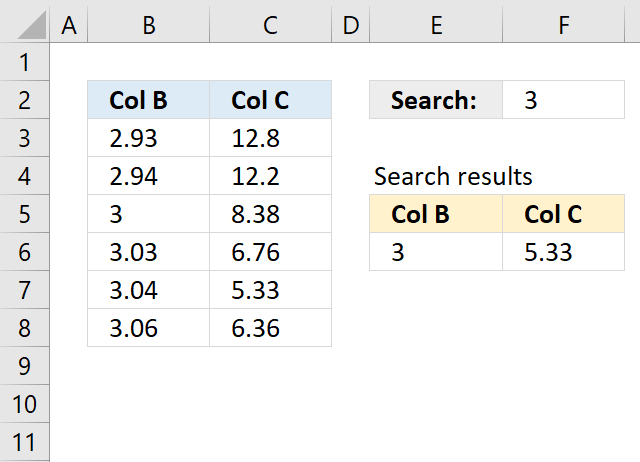 That way I can quickly match the corresponding values with the original search ref. Thanks for the references to excel on your website, they have been very helpful. I am trying to alter your formula without any avail. Any assistance would be great. Thank you in advance. 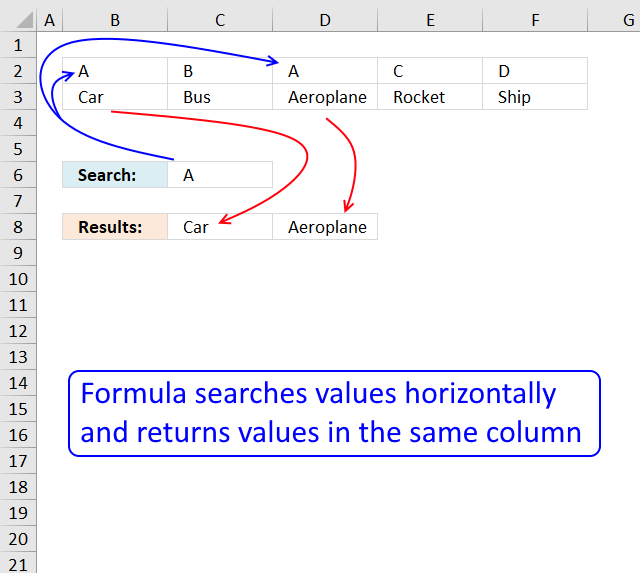 This formula only lists the first value when copied horizontally. Nevermind my last post, I got it. Once again thank you for the website. I will leep it as a favorite because I know I will be needing it another time. Thanks for the example. i am not sure how to modify it so it meets my need. Hope this clarify. Thanks in advance. i am hoping you could please assist me with the following, i have looked through many of your posts but cannot seem to find a solution. I am trying to match 2 cell values, and return a third value from a source sheet in vertical rows. I have tried other formulas too but nothing seems to be working, this seems to be the closest to what i am after. Holly, you have forgotten absolute cell references. I am not sure about these cell references: $D$2 and $E$2. It depends on what you are doing. Oscar this is a great post thanks! I have a question similar to the original post. I need a formula to say if the pen was purchased at Walmart how much did it cost? 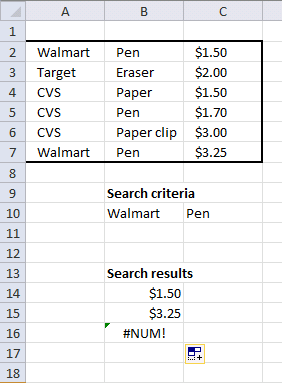 Instead of search criteria being Pen and Paper I would like the search criteria to be Walmart and Pen. The return would be "$1,50" and "$3,75"
correction: I had one typo the return would be "$1,50" and "$3,25"
Hi, I need some help! I am trying to create a way to search different kits at one time. Let's say I have three columns, one for "Kits", one for "Products", and one for "Quantities". Is there a way that I can search multiple kits at one time to bring up the different products and quantities? My data spreadsheet has several data points with over 3,000. What is the easiest way to go about this? Thanks! Can you please e-mail me so I can attach the file that I need to have these search entries for? Every time I try creating or editing the spreadsheet I get a "#VALUE" entry instead of pulling from my data. Oscar, I hope you can help me. I need to do this formula (preferably with the dynamic range name like you have here)but without the use of the COUNTIF? Ive tried combinations of SUM (IFs) but can not figure it out. The reason is with Countif, sumif and etc you need the source file open... I need to do the multiple lookups when the source file of the table is closed. Is this possible? I am working in a railway project as planner. How can i create a dynamic strip chart in excel? Assume total length be 10 kilometers and each cell of 100 meters. If I update the progress from 9.01 kms to 9.08 kms in the table, how the cell gets highlighted corresponding to the entered chainages. How do I lookup lot ref no ranges in between in below data set. For eg lookup for "SEC48" would be "Lot1"
Thank you for this formula. This is great! I’m trying to do something similar but can’t seem to make it work. I’m hoping you can help me figure it out. 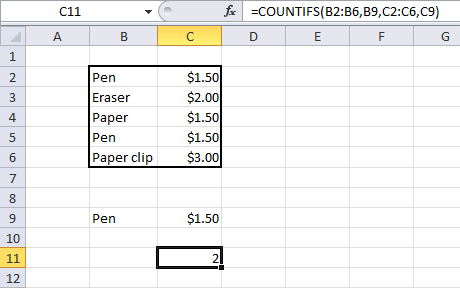 I’m trying to compare column A on 2 sheets (Sheet1 and Sheet2) and if it finds a match then compare column C ($ amount) of that row on each sheets and display the difference of column C in column D.
If column A has an ID # with contains letters, numbers, and symbols but isn't always a unique ID # and column C has a $ amount, find the match and put the $ amount difference in column D.
So if the ID # and $ amount match exactly, the difference would be zero, if the ID # matches but the $ amount doesn’t, the difference would be the $ amount of one sheet less the $ amount on the other sheet, and if there is no match the $ difference would be the full $ amount. Is there any way to use your formula to do this? 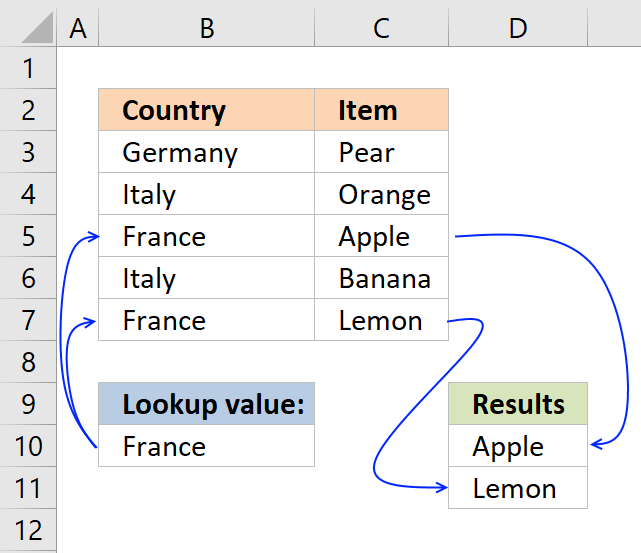 Hi, I've been struggling with something for a few days now and I'm not even sure that I can do it in Excel? I've tried various forms of INDEX MATCH and MMULT and anything else that I thought might work. The concept is simple. I need containers in various cabinets for a home remodel. The catalog that I am perusing has TONS of options and I have specific dimensions that I need to satisfy for each cabinet, drawer, etc. So, I have a spreadsheet that lists my actual dimensions in three columns (width, depth, height) and all of the possible options from the catalog along with columns for their dimensions (width, depth, height). I need to find which catalog trashcan would best fit my space. I need to find a dimension for width that matches MY space's width (less than or equal to), same for the depth and height. BUT, I need to do this for all three dimensions AND get Excel to return the product number that best fits. Am I asking too much from Excel? I realize that a database may serve this purpose better but I'm dragging my feet on going with a db. So, product #311 works but it is not the best choice (too small). #315 works for depth but not for width or height. If I were looking for the correct one, I might pick #313 as the best fit but #314 also works. 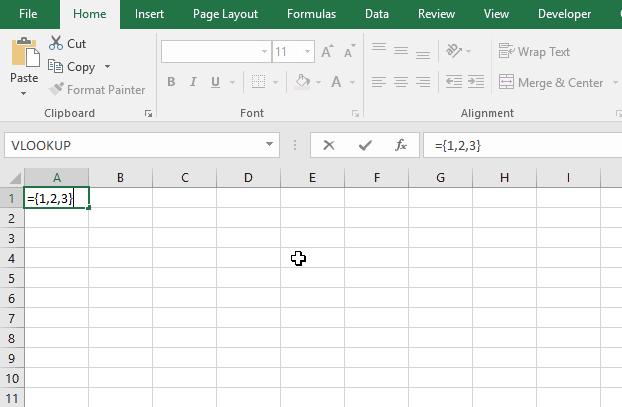 I'd be thrilled if Excel would pick either or both of those LOL. Obviously, my spreadsheet is much larger with too many options for me to look through myself. If I could get excel to return ALL products that fit the criteria (all product dimensions are smaller than the actual space dimensions), I'd be happy.